A delegation of 34 people from Papua New Guinea visited the Western Wall last week and donated a kilo of gold and several thousand dollars to the temple Institute, an organization dedicated to rebuilding the Temple in Jerusalem. The delegation's participants, who define themselves as members of "The Bible Circle", told the institute's workers that they study the bible on a regular basis. Recently, they read the prophecy of Zechariah, where it says: "And they that are far off shall come and build in the temple of the Lord, and ye shall know that the Lord of hosts hath sent me unto you," and decided to follow the verse and come to Israel. The Papuans explained that since their country was rich in gold mines, their donation was "nothing out of the ordinary," but added that in the future they hoped they would be able to send valuable wood for the new Temple's construction. "They pulled gold bullions out of their bags, and even started to take off their jewelry, apologizing it was too little," head of the institute Yahuda Glick told Ynet. "There was even a married couple who gave me their wedding rings and said they wanted to marry God." "The scene reminded me of the legends of King Salomon I read when I was young, and pictures of the Queen of Sheba bringing gold and precious gems to the Temple. The vision is literally coming to life before our eyes," Glick said enthusiastically. 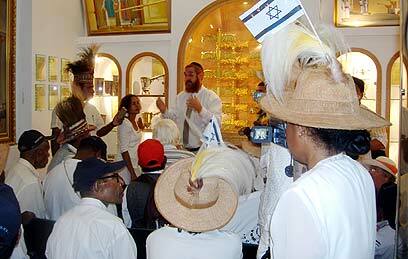 See all talkbacks "Papua New Guinea delegation donates gold for rebuilding Temple "